It was slick going this morning on the ramps going up to Chestnut and Market St. Be careful out there. The Schuylkill River Development Corporation and Fairmount Park have done a good job this winter laying salt on the SR Trail, let's hope that this continues, in the meantime use caution. 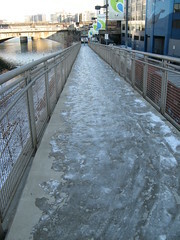 I also noticed that the chestnut street bridge paths, on both sides, were completely covered by ice yesterday. Don't know about today, but this is absolutely unacceptable that all bridge paths haven't been cleared of snow and ice ASAP after a storm. if anyone slips and hurts themselves, they should sue the city for a boatload. I did see an employee of the SRDC clearing the stairs on the walnut st bridge on the day of the storm, which was great though.